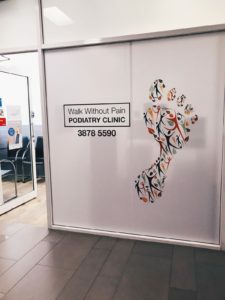 Walk Without Pain Podiatry is located within Indooroopilly Shopping Centre, a 5 minute drive from Sherwood. The center is serviced by buses and trains. Our opening hours are Monday to Friday 8:30am to 5:00pm. We are also open from 8:00am to 12:00pm on alternate Saturdays. Injuries to the feet can be painful and particularly problematic in that they are difficult to heal. The constant use of our feet means that without the appropriate professional care they can become more intense over time and even lead to more severe health issues if left untreated. If you have an injury to your foot – incurred through accidental injury, over-exertion or a sports-related event – you need to make sure that you get it fixed as soon as possible to give yourself the best outcome. Working with a podiatrist is the best way to make sure you get the ultimate treatment option, and you can’t go wrong by working with Walk Without Pain. With 9 podiatrists we are a very large team and each of us has our own specialisation areas – no matter what your injury one of us will have studied it intensely and know the best way forward! Between us, we have almost 100 years of combined experience. We are all united by our shared passion for good work and the best possible patient outcome, which we work to achieve each and every day. Given the large size of our team, we are capable of seeing a large number of people each day, meaning that you don’t have to wait for long periods of time while your injury worsens. We do everything to help you achieve the best possible results – we’ve even thought about the parking situation so that you don’t put excess strain on your injury! As a professional clinic, we have the specialist equipment that is necessary to treat even the rarest and most challenging of injuries. We can offer shockwave therapy, laser treatment and in-house ultrasonography to make sure your injury is resolved effectively.